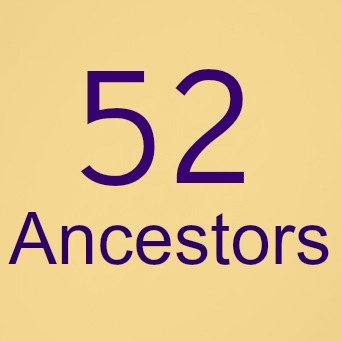 I wanted to continue my 52 Ancestors challenge with another woman. 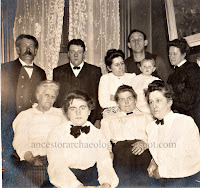 My 2nd great grandmother Agnes Fraser Irons. When I began the 52 ancestor challenge I had intended on focusing on my female ancestors, but found it (obviously) difficult. The farther back I went the less information I could find. Agnes is no exception, so the story of her life will be told with facts I am able to discover of her father and her husband. I first 'met' Agnes when I received a box of photographs upon my father's passing. The box contained an assortment of photos of people in various decades of history. Most of them were not labeled. My dad, having just passed, could not be asked about these relatives. My mom helped the best she could and I pieced the rest together - mostly. The photos really intrigued me. Who were these people? I set out to find out. Agnes was born in New York City January 4, 1833 although she began life in Edinburgh, Scotland. Her parents Alexander Fraser and Elizabeth Chalmers were married in the spring of 1832 and soon after set sail for America and the dream of a better life. The young, expecting couple arrived in New York City in the autumn of 1832. Agnes' father was a master baker and flour merchant in Scotland, from a long line of mill men and master millers. What brought them to America I have yet to discover, although it may well have been to establish the family's business on new shores. But this story is about Agnes. Agnes was the oldest of 5 children. She had two younger sisters and two younger brothers. I don't know much about her early life or if she attended school. I would suspect she did, this was not a family of pioneers living on the desolate plains. 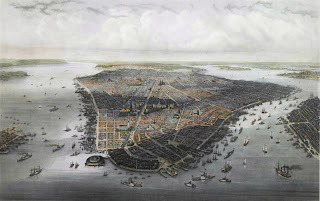 New York was a well established city and there were numerous free schools, ward schools and religious schools operating in Manhattan at that time. In looking into to the history of the time, the Seneca Falls Convention may have been a hot topic around the Fraser household in 1848. Agnes, 15 years old by then, I imagine held some opinions in favor of the convention. As a 21st century woman, and a rather bull-headed one at that, I have trouble wrapping my head around the time when women were property, second-class citizens with no voice of their own. I would like to imagine that Agnes was very much in favor women's rights and held a strong opinion. 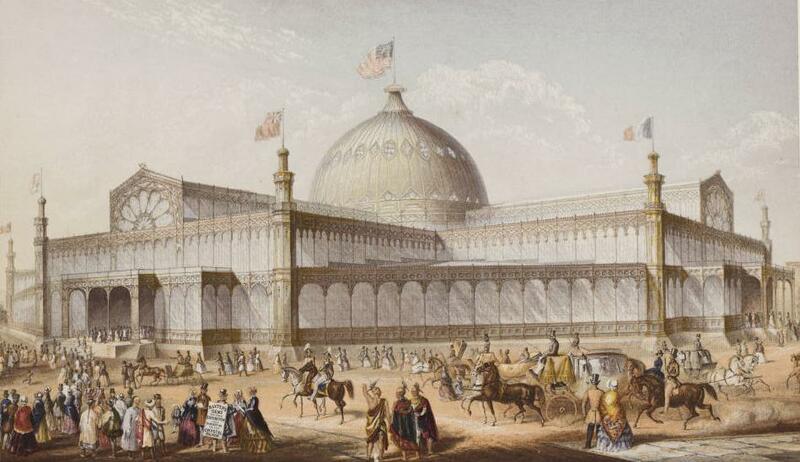 In 1853 the World's Fair, Exhibition of the Industry of All Nations came to New York City. The Crystal Palace must have been something to see! I'm sure, as a young woman of 20, Agnes would have attended such a marvel. I know I would have! This may well have been where she met her future husband, James Irons III. An exciting young Scot who had recently immigrated to the United States, by way of a two year detour to Australia to mine for gold. On May 1, 1855 Agnes and James were married in New York City, and by the following spring were settled in their new home in Chicago, IL. 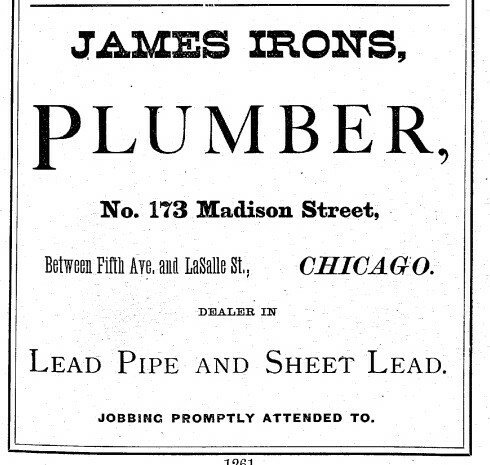 James Irons opened a plumbing business and Agnes went about putting their new home in order. They are found living on Madison Avenue at the corner of LaSalle. 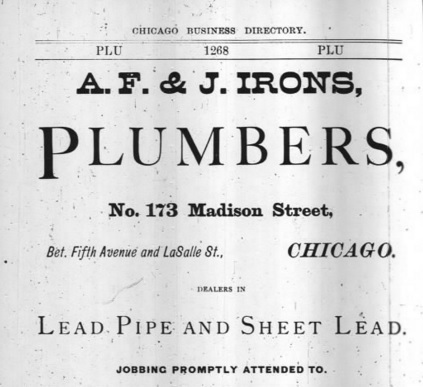 The residence was also the location for James' plumbing business. There was a large livery and stable next door. 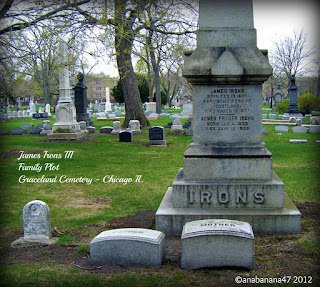 In March of 1857 the Irons' welcomed their first born, a son named Alexander Fraser Irons. Sadly, the baby died just 3 months later. The young couple purchased a large plot in Graceland Cemetery and laid their son to rest. The following March Agnes gave birth to their second son, a health baby also named Alexander Fraser Irons. In January of 1860 Agnes gave birth to twin daughters, Elizabeth and Christine. The growing family was still living on Madison Avenue. 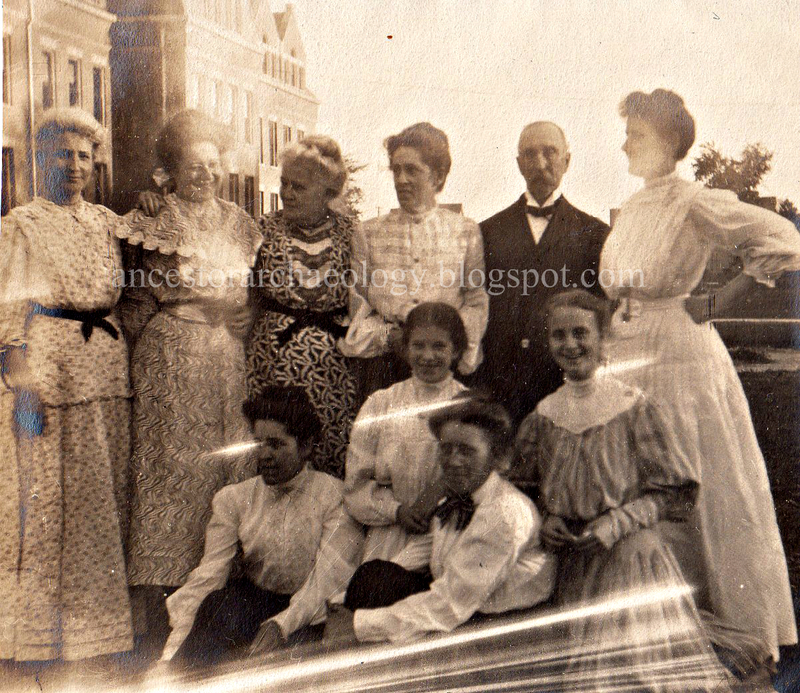 In March 1862, still squeezed into the Madison Avenue home, their son James was born, and in March of 1864 their daughter Aggie arrived. With 5 children under the age of five to care for I'm certain Agnes had her hands full! 1867 proved to be a bittersweet year for the Irons family. The couple welcomed their sixth child, a daughter named Janet, on the 13th April, only to lose Aggie, who had just turned three, 17 days later. The family buried their little daughter next to her brother in Graceland Cemetery. 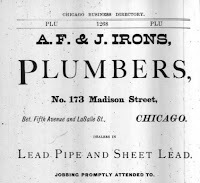 By the spring of 1871 the Irons clan had relocated to a home farther west, across from a fine park, on West Adams St. James continued to operate his business out of the Madison Avenue address. In October of that year I'm certain the family was extremely thankful they moved when they did. The Great Chicago Fire burned the area surrounding the plumbing business, where they were residing just months prior. I don't pretend to know the horror of watching, helpless, as the city burned. Of wondering and worrying about friends and family who lived in the area. Of where the fire would spread or when it would stop. Agnes was newly pregnant in October 1871 and the family was no doubt wondering if their livelihood was being irreparably destroyed. The business survived, the building most likely did not. The business had a Halsted Street address in 1872 but by 1873 it was back on Madison Street. In May of 1872 Agnes gives birth to a son they name William - who ironically (?) grew up to be a City of Chicago fire chief. 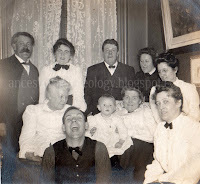 And finally, in 1874, the family's last child, a son named Charles, was born. Life was settling down, Agnes had her hands full raising 7 children from teens to infants. Then, in 1877, another tragedy. James died just one month past his 50th birthday. Leaving Agnes with a lot of mouths to feed and a business to look after. 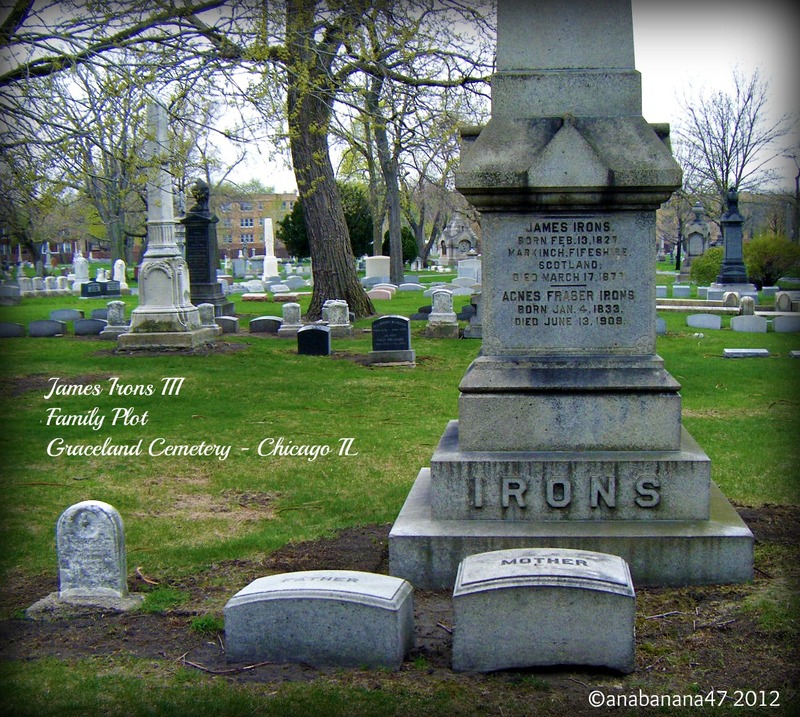 Agnes and her children buried James in Graceland Cemetery with his two young children. 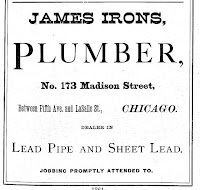 There must have been some knowledge of James' illness and impending death, the plumbing business changed names in 1877 from James Irons Plumbing to A.F. & J Plumbing. A.F. being Agnes Fraser and J. being James' brother John. The pair ran the company, employing sons Alexander and James, for the next 15 years. 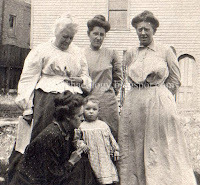 Most of the children continued to reside in the family home, helping their mother with the household expenses. The next decade appeared to be a tedious but joyous one as Agnes buried her sister in 1879, her father in 1883, her mother in 1889, and her brother in 1890. All in the large family plot in Graceland Cemetery. She witnessed the marriage of her son Alexander in 1882, her daughter Christine in 1883 and the birth of her first grandchild in 1885. When the 1893 World's Columbian Exposition rolled into town I would suspect Agnes was quite ready for some distraction. This would have been her second World's Fair. How exciting! But there was another, darker affair playing out that I imagine was the bigger news of the time. Dr. H. H. Holmes, serial killer. His gruesome murders and ultimately his own death sentence made for quite a lot of talk around the city. 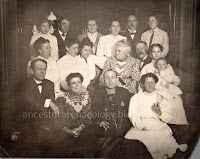 By 1900 Agnes had two more grandchildren, had seen her son James married and was planning for her son William's wedding. William and his bride Margaret gave Agnes two more grandchildren. The family remained close. The adult children that never married remained in the family home with Agnes. Her daughter Christine had moved to Montana, but the remainder of the family lived in Chicago. Agnes died on June 13, 1909 and was buried in the family plot in Graceland Cemetery. One year later her youngest son Charles finally settled down. He and his wife Clara had three children. 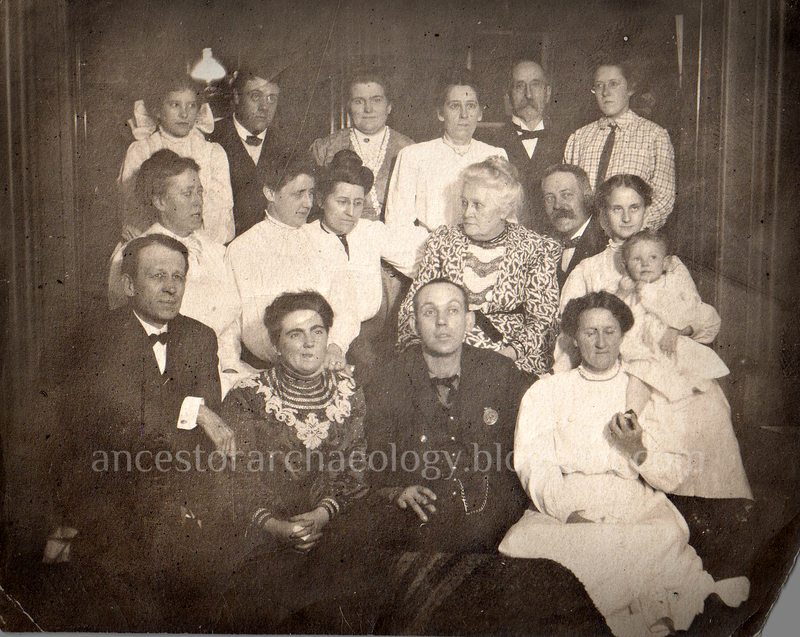 I am currently in the process of tracing the many living descendants of Agnes and James Irons.